Last year's momentous Red Bull Stratos mission was an amazing feat in human advancement, technology, and awesomeness. A YouTube sensation, Felix Baumgartner would set a host of records including longest freefall, highest jump from a platform, and the maximum vertical speed reached by man. This week, the final recorded data from the Stratos mission was released by Red Bull, altering the original estimated records set by Baumgartner. Fortunately, the adjustments were incremental, and all of the records remain intact, including one that's been raised even higher. Originally, Baumgartner's fall was reported as reaching speeds of 1,342.8 kmh/833.9 mph/Mach 1.24, thus breaking the sound barrier and challenging aerospace conventions forever. However, the recently revised data showed Baumgartner actually achieved speeds of 1,357.6 kmh/843.6 mph/Mach 1.25, which not only raised the bar that much higher for the next guy, but also demonstrated even faster speeds at which safe human travel through the sound barrier was possible. Unfortunately, Baumgartner's previous platform jump record of 39,045 m/128,100 feet was reduced, when more accurate data showed he actually fell 38,969.4 m /127,852.4 ft instead. The same could be said for his vertical freefall record, which once stood at 36,529 m/119,846 ft, but was discovered to be 36,402.6 m/119,431.1 ft after it was all said and done. Even so, the scientists at Red Bull were more than pleased with the results, as they have impacted the future of space travel tremendously. "Together we proved that a human in freefall can break the speed of sound returning from near space, going through a transonic phase and landing safely on the ground," said Jonathan Clark, Red Bull Stratos medical director. "That was a big part of the program, and monitoring the mission was a meaningful event in aerospace medicine and physiology." According to the latest info, Baumgartner provided the medical and science teams with more than 100 million data points. The Stratos mission provided the first even physiological data for a human being traveling at supersonic speeds, and provided a glimpse at the pressures and forces Baumgartner's body endured throughout the drop. After experiencing 25.2 seconds of weightlessness upon the start of the freefall, you may recall Baumgartner entered into series spins reaching a peak of 60 revolutions per minute. Even during those seemingly dangerous moments, his safety was never in jeopardy as data showed his cranial region never reached the critical 2G speed limit while rotating. Throughout the jump, Baumgartner's heart rate topped out at 185 beats per minute (when he first jumped), and stayed between 155 bpm and 175 bpm while falling. 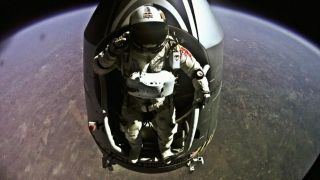 As he broke the sound barrier, his heart rate reached 169 bpm, and only dropped to 163 bpm by the time he hit the ground. Though Baumgartner's jump will take all the glory, there was more to the Stratos mission than just having a man fall from the sky. A new treatment for ebullism, where blood spontaneously boils at altitudes of 19,200 meters/63,000 feet, had to be developed using a new ventilator in the field as protocol. "We've developed a clinical practice standard that will be one of the major outcomes of this program," said Clark, who is also a six-time Space Shuttle crew surgeon. "Red Bull Stratos is already producing tangible results that will allow potential space travelers who are in this danger zone to have a fighting chance if they get exposed to vacuum." Additionally, a new parachute system was developed, which could make high-altitude payload recovery much easier to manage in the future. Previously, a chute would deploy the instant a high-altitude payload was released from its balloon, however the new "reefed" parachute only opens a small portion for part of the decent, opening fully a short time later. According to Red Bull, this not only makes predicting the landing zone more accurate, it also reduces the descent time by two-thirds. How quickly such advances are put to use in more practical situations remains to be seen, but it would appear the Red Bull Stratos mission proved to be even more of a success than its developers imagined.